Hi friends, After a long time I am back. Got busy with my studies and family. Let me share a traditional Kerala style fish curry. People from northern Kerala calls it Malabar fish curry / Kozhikodan fish curry, while those towards the Travancore region, calls it Kottayam style fish curry and some calls it simply Meen Mulakittath. This is the simplest to prepare fish curry which even the amateurs can cook at home easily. The curry tastes better on the second or third day after preparation. Let me go straight into the preparation. Wash and soak the gambooge (Cocum/Kudampuli) in a glass of lukewarm water for 5-10 minutes. Grind the ginger and garlic pieces into a paste form in a mixer. Clean and cut the fish into medium sized pieces. I suggest using Seer fish or Tuna. In an earthen clay pot (preferably – for the traditional taste) or a pan heat some oil. When oil gets hot add fenugreek seeds, saute it slightly and wait till it turns slightly dark. Add the chopped onions, the ginger garlic paste, curry leaves and green chillies to the pan and saute them till it gets slightly fried. Reduce the flame and add chilli powder (preferably Kashmiri Chilli), coriander powder (optional), turmeric powder and saute it well until they turn golden brown. Add the soaked gambooge, 1 cup of extra water and salt as needed (taste it!) to the mixture, cover it and allow it to boil. Add the fish pieces and add more water if needed, so that the fish pieces gets just covered. Cover with a lid and bring it to boil in low-medium flame. Usually it will take 20 to 30 minutes. Swirl the pot / pan in between. Once the fish gets cooked, turn off the flame and add some coconut oil over the curry. This fish curry goes well with appam, idiyappam, kappa and other breakfast dishes. My mom wont use corriander powder because it will reduce the shelf life of the curry. Taste the curry, after preparation. If it is too sour remove one or two pieces of gambooge. Kashmiri chilli gives intense red color to the curry, but it is less spicy. If you want to make the curry spicy, add normal chilli powder instead – Adjust the spiciness as per your tolerance. In step 9, before adding the spices, make sure you reduced the flame and spices are not fried too much. Other wise the curry may taste bitter. Don’t add too much water. Add water just to cover the fishes. It is best to keep the curry idle for 1 day and serve it next day. As the curry sits, it thickens a little and deepens the colour. If you want a dry type curry, you can keep the lid open and cook it for more time in step 11. 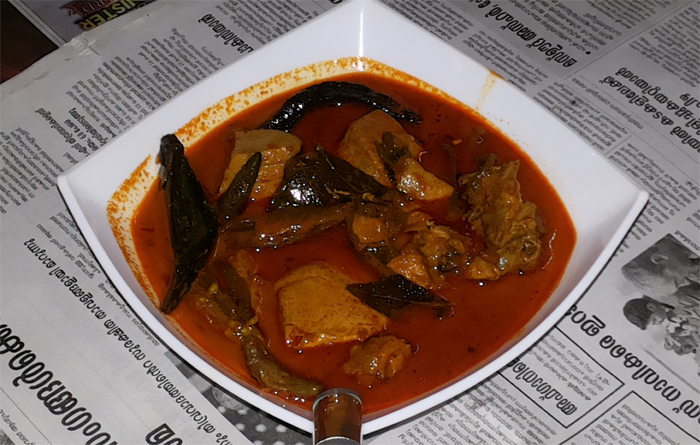 This entry was added on April 15th, 2016 by Cini P Moideen in Non Veg and tagged with kerala fish recipes, kottayam fish curry recipe, kottayam fish curry, meen mulaku curry kottayam, fish curry, kottayam fish curry kerala recipe, kerala fish curry, how to make kottayam fish curry, best fish curry recipe. Last revised on April 4th, 2018.